By now I’m sure you’ve heard about the One Pot Blogger Cooking Party I’m participating in with 19 fellow bloggers. It’s a 3 week blogging event to promote Emeril Lagasse’s new book Sizzling Skillets and Other One Pot Wonders which is being sponsored by Morrow Cookbooks. This is Emeril's Eggplant Involtini. What makes this recipe different than any of the hundreds of others out there is that the eggplant is broiled and baked…never fried. Trust me it’s got the same great taste you get from the traditional fried version but not all the added fat and calories. Which I do think is important. Thin layers of eggplant stuffed with a mixture of balsamic, bread crumbs, tomatoes, herbs, pine nuts and mozzarella…you won’t even notice they aren’t fried. And just think of the time savings in the kitchen. I was able to whip a pan of these up in minutes; baked them for about 20 minutes more to melt the cheese and I had a wonderful vegetarian dinner. Ok…on to the contest. Here’s what you need to do. Leave a comment on this post telling me why you want to win this book. Maybe you’re a huge fan of Emeril (well that’s a given) or maybe you have been waiting for a book with One-Pot recipes. Whatever the reason it doesn’t matter; just let me know. Now if you’d like to “Kick it Up a Notch” you can leave me separate comments for each of the following that you do. Contest ends Sunday September 18th at midnight EST. Winner will be picked randomly. Disclosure: I was provided a copy of the cookbook, a set of the serving dishes by zak!, a bottle of Emeril’s spices, and a small grocery reimbursement. Upon completion I will also receive a few of Emeril’s other cookbooks and one blogger will be chosen to win a T-Fal slow cooker. All opinions shared are my own. I love reading your posts and can't wait for more! I have friended Emeril on Facebook and Twitter. I would love to have his new cookbook. Being a single mom, one pot meals are done several times weekly. I'm always looking for new recipies. Wow, that eggplant involtini looks amazing, and I love the fact that's it's a healthified recipe. The idea of a whole cookbook of one pot recipes is really interesting and would be great for weeknight dinners when I'm rushing after work. I "like" Emeril on Facebook. I follow you on twitter as cobblehillgal. There is little I love more than eggplant covered in cheese! This looks SO GOOD. I'd love to win this because I don't have a dishwasher! And so more one pot meals = less cleaning = a happier me! Love Emeril and I love one pot dishes!!! This book sounds wonderful! I follow you on twitter and like you on facebook. That eggplant looks delicious! I want to enter this contest a million times. I now follow Emeril and Morrow Cooks on twitter and am looking forward to their posts and finding new recipes. :) Thanks for this opportunity! I wanted to try this recipe too, it looks fantastic! Sounds perfect for a person with diabetes! On my list of recipes to try. Emeril taught me the best and only way to make bacon...put it in the oven! 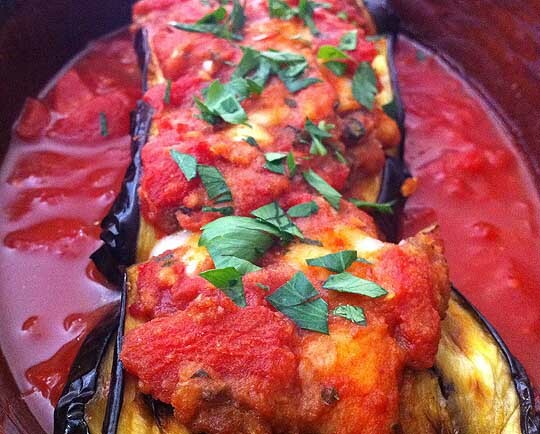 I just started drooling when I saw your picture of your Eggplant Involtini dish lol! I like the concept of one-pot cooking because of ease. If I won this cookbook, I'd like to do versions of his recipes that are dairy-free, egg-free, and/or gluten-free for us with food allergies. In fact, I started working on a version of the Involtini that uses a dairy and soy free cheese alternative. I thought I had already Liked Emeril Lagasse on Facebook. Well, it's done now! OK, Food Hunter, I'm in for this contest. Mostly since I love one-pot meals. Somehow they are the ultimate comfort foods for me. Food Hunter, this will begin an embarrassment of riches, but you asked for it. I now like Emeril on Facebook. and, I now have sent you a friend request.. on Facebook. ..and... I now like The Secret Ingredient ...on Facebook. Hi! I would love to win this book because it sounds perfect for fast and easy but tasty recipes such as the pic posted above, that would help me get munchin in no time! I work/commute 15 hour days, and I just moved into my own apartment with my husband who is a veteran, and needs to lose a few lbs from injuries. I would really love any help I can get. Also, I have done all of the above 1-6 of twitter facebook requests! Bless you! Emeril is a part of the Mississippi Coast and the cuisine here. Bam! I want the book! I so need a one pot cookbook! With all the crazyness of our family's schedules, I don't have time for extra dishes! Thanks for the opportunity to enter! I found out about this giveaway b/c I follow Emeril on Twitter. Does that count for #2? I've been reading all the bloggers reviews and descriptions of some of the recipes and I can't wait to get this cookbook so I can start cooking. Our dinners have gotten boring, so time to do the Emeril thing and kick it up a notch! I want to win to make this incredible recipe! Hay yall Id love to have this cookbook of Emerils..I have many of his and some are even signed for me. Was in NOLA and ate at his Delmonicos it was awesome then we had apps. at NOLA..we ate our way through NOLA. I love his food..and him too! Please help me get the new cookbook..it would really be so cool to win it!I could even trade Emeril a cake of ours if he signed my new book for me too! so cool! I'm now following Emeril on Twitter! I liked the Secret Ingredient blog on facebook! And now I am following Morrow Cooks on Twitter! Oh seriously? I must have this book. Emeril is my all time inspiration for creating and doing what I do best in the kitchen. He has taught me how to literally "kick recipes up to notches unknown". I hope I win, thank you very much. I want that cookbook, I hope I win. I bought the book yesterday, thanks. Looks like you guys had fun, thank you very much for sharing. I would really love to have his book. Is it available online? Eggplant Involtini is plated magnificiently in this picture! I remember those restaurants in beccles suffolk in this presentation. Normally I hate eggplants but after looking at this picture I would love to eat this.